Every time a new ruler is introduced in 1-2 Kings, the metaphorical ax hangs in the air. Will he do good or evil in “the eyes of the Lord”? An especially scathing postscript is added to Manasseh’s introduction. Not only did he do evil; he led the people “according to the despicable practices of the nations whom the Lord drove out before the people of Israel” (2 Kgs 21:2). Every ruler receives the judgment; it’s pertinent because wherever the king leads, the people follow. When Manasseh’s grandson, Josiah, takes the throne in Judah, it’s soothing to read that “he did what was right … he did not turn aside to the right or to the left” (2 Kgs 22:2). Josiah’s first recorded act is asking a high priest to help him repair the temple of God. During the renovation, the high priest finds the “Book of the Law.” When the book is read aloud, Josiah realizes how far Judah had fallen from worshiping Yahweh. He begins a series of reforms; first, making a covenant with Yahweh (2 Kgs 23:3). If we look up the word “covenant” in The Anchor Yale Bible Dictionary, we learn that it’s an “agreement enacted between two parties in which one or both make promises under oath to perform or refrain from certain actions.” Covenants and covenant ceremonies were integral to the political makeup of the ancient Near East. Animals were often slaughtered as part of a covenant ratification ceremony. We can search for other passages using karath with the Enhanced Brown-Driver-Briggs Hebrew and English Lexicon (BDB). Here we find that karath is often used in a literal context—to describe cutting down trees (Deut 19:5), cutting cloth or clothing (1 Sam 24:4), or even cutting off a body part (2 Sam 20:22). However, karath can also be used metaphorically to indicate the destruction of someone or something (e.g., Deut 12:29). In Genesis 15, karath and berith appear together to describe a covenant ratification ceremony. Yahweh makes a promise to Abram that He will give him land, descendants and blessing. When Abram wonders how he will know this for certain, Yahweh instructs him to cut various animals in half; Yahweh then passes between the pieces of the animals. 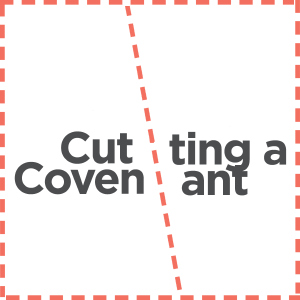 By cutting the animals in half during covenant ceremonies, the parties making the covenant were effectively saying, “Let this be done to us if we break the terms of this covenant.” In the ancient Near East, this type of covenant would have defined the relationship between a king and vassal; in 2 Kings 23, the covenant Josiah renews will define the relationship between Yahweh and His people. Josiah is faithful to the covenant. He destroys the high places and restores the Passover. He is remembered as the king “who turned to the Lord with all his heart and with all his soul and with all his might” (23:25). But he is also remembered as the king that had no equal. Those that follow are like those that preceded him. While the imagery of “cutting a covenant” was supposed to help Judah remember, they continued to do evil and are taken captive by Babylon just a few generations later. It’s a reminder that Yahweh takes loyalty very seriously. We should take loyalty to Him just as seriously. Genesis 9:11 is the first time that karath and berith appear together. But in that verse, the traditional language of cutting a covenant is not used. A different Hebrew word (kum, קום) is used for God establishing His covenant. Why? Because God is promising that He will never again “cut off” (karath, כרת) all flesh from the earth. The traditional phrase is avoided because of the use of karath later in the verse.